Embroidery, like all artwork, is a culturally significant artifact as it represents people’s beliefs and traditions. Traditional Ukrainian embroidery is an intricate skill that has spread and evolved over centuries. It has created a common folk culture in Ukraine and beyond. Embroidery has a substantial role in Ukrainian lives since the fabrics are used during special occasions for blessings, worn by family members, or part of a therapeutic skill, which has been passed down through the generations. 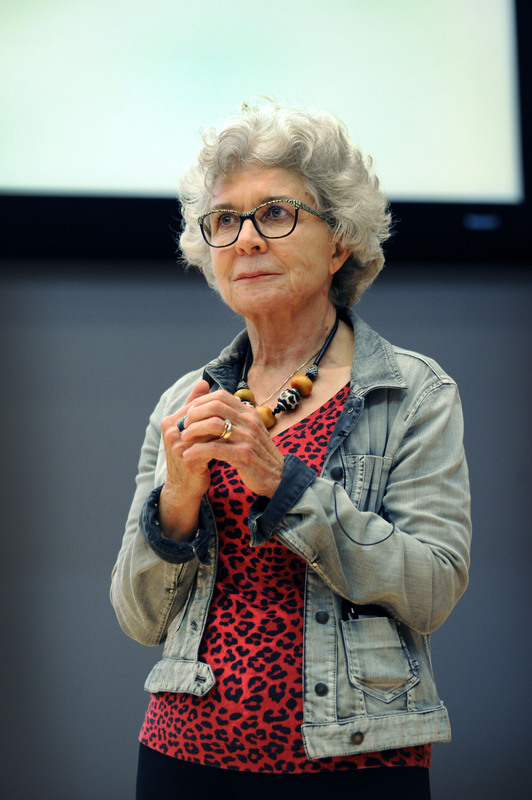 On the occasion of the “Image of Ukraine” exhibition opening, Natalie Kononenko, Professor and Kule Chair in Ukrainian Ethnography at the University of Alberta, delivered a keynote on Ukrainian embroidery and its symbolism in history, culture, and folk traditions. In her presentation, she attributed the skill of Ukrainian hand embroidery as being derived from a long popular art practice in Eastern Europe that was passed down from generation to generation, carrying stories of hope, religion, injury, and love. Kononenko, a passionate connoisseur in embroidery, showed some of her artwork, which uses beautiful hues of threads in rose and pansy designs among other geometric designs. Though the designs are created on fabric, they are displayed like a photograph or tapestry rather than a towel or curtain. The artwork used in the fabric represents the culture of the Ukrainian people and it intertwines a sense of magic into it through the colorful fibers that represent wishes and prayers. Fine colored threads are interweaved to create traditional clothing called a nabozhnyk (a highly intricate lace design) and rushnyk, used as religious draperies or in wedding ceremonies. 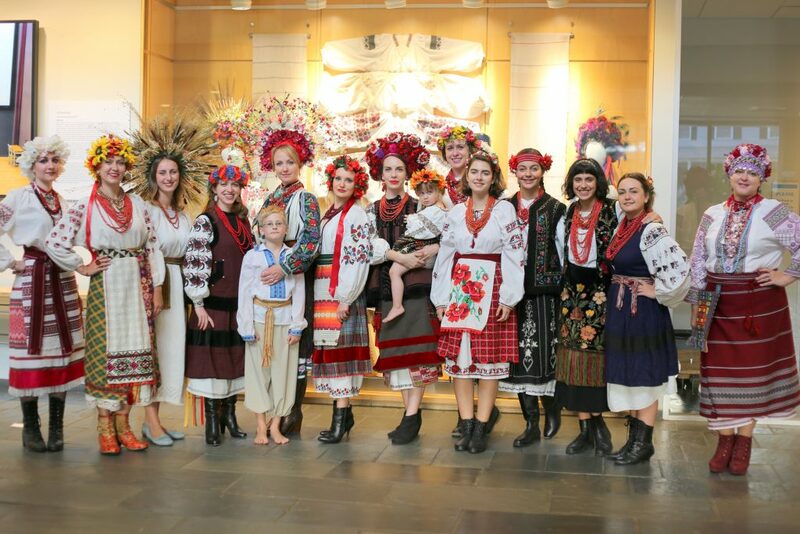 Kononenko’s lecture was crowned by a “fashion show,” which consisted of Ukrainian community volunteers wearing creatively contoured full embroidery sets, most of which came from their family heirlooms. The fashion collection ranged from everyday wear to evening gowns and included men’s wear as well. With about twenty different region-specific designs represented, the show reinforced the impeccable design variation and artistry that are characteristic of Ukrainian embroidery. With the evening drawing to a close, the organizers of the exhibit and opening reception, most notably Ingrid Smith and Donna Goldstein, were thanked by many for their hard work and dedication, and for uniting the support between the college and the Ukrainian community. The opening reception was graciously hosted by UNC Global Relations, and organized by the Ukrainian Association of North Carolina and the UNC Center for Slavic Eurasian and East European Studies.